You Are Here: Home » High Index Lenses » What Are High Index Lenses Made Of? What Are High Index Lenses Made Of? High index lenses can be made of a variety of plastic and glass materials. High index plastic is a plastic material that is denser than standard plastic or polycarbonate. High index glass is similar in that it’s made of a glass material that is denser than crown glass. The increase in density results in the lens’s ability to refract or bend light more efficiently than standard lens materials. This is where the term high index comes from in the first place. “Index” refers to the index of refraction of the material, or the efficiency with which a lens can bend light. A high index lens can bend light (such as for corrective lenses) more efficiently than standard materials, meaning that the lens requires less material for the same prescription in a standard lens. So density is what makes high index lenses thinner. High index lenses are made of a denser material than standard lenses. High index plastic is denser than standard plastic, and high index glass is denser than crown glass. The density of the material relates to its index of refraction: the denser it is, the more efficiently it bends light. This allows high index lenses to be made into corrective prescription lenses using less material than standard index lenses. High index refers to “index of refraction.” The higher the index of refraction, the better a lens is at bending light, and the thinner it will be. Higher indexes of refraction have two major downsides: they are more reflective, leading to distracting glare, and they cause color aberration, which is a blurring and streaking of lines and colors, especially in the periphery. Typically, the higher the index, the worse the glare and distortion will be. 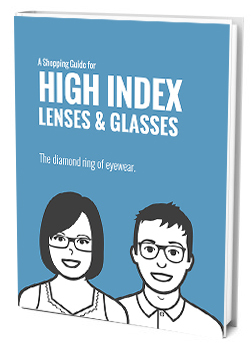 High index usually also makes a lens more brittle, leading to easier cracking and shattering of the lenses, especially in glass. The thinness of high index confers several benefits: it is lightweight, it looks better, and it does not make your eyes look as distorted from the outside as normal lenses do. If you want to know more about the specific materials that high index lenses made of, it will probably be difficult. Most lens manufacturers do not readily disclose the chemical composition of their lenses. For most people, anyway, it is enough to know that high index plastic is made of a different, denser chemical than standard plastic, and the same is true for high index glass. This density is what confers all the benefits (and weaknesses) of high index lenses, so it is the main factor that sets high index apart from standard lenses. If you want to learn more about high index lenses, take a look at some of our other blog posts, and thanks for reading!